If you've been following along in this series you've already created a Rails application called "attackresearch, configured your Ruby/gem environment with RVM, and created a Rake task to start the application with Unicorn. In this portion, we will create our first Rails page and configure the appropriate routes. 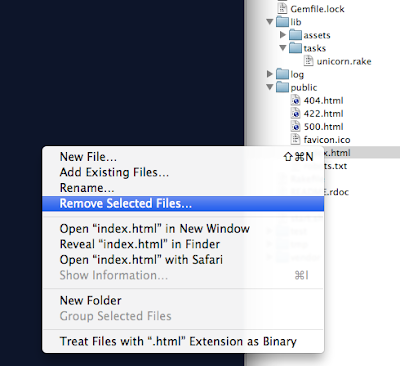 Removing this file removes the new Rails application landing page as it is unecessary. Fire up the server using the rake task created earlier in this series and browse to the site. Why did this occur? Rails requires some direction from you, the developer. Where does the default or "root" page live and how do I get there? Notice the comment? Each comment block provides instructions on mapping routes in various ways. You can delete them :-). Leave the first and last line (actual code) but remove the comments. Remember the twitter-bootstrap-rails gem we added in the first part of this series? We just installed it. This allows us to forego some CSS and HTML work and piggyback off those of the Twitter designers (thanks gals/guys). Model - Used for handling data resources (databases, usually). View - Renders HTML content to users. Controller - Code that handles the bulk of the logic and decision making. Note that a new *View* folder was created app/views/home and a controller file "app/controllers/home_controller.rb". One thing to be aware of. 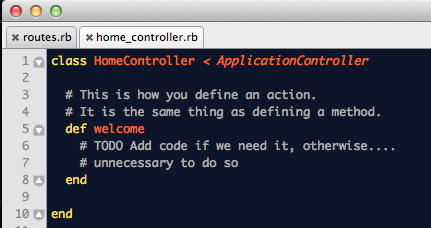 The name of your controller will have `_controller.rb` appended to it. This is the standard convention. Make an action inside the home controller called "welcome". 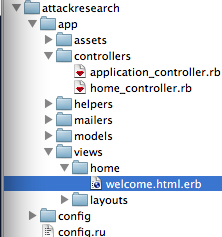 Create a view page under the /app/views/home folder called "welcome.html.erb". Configure the route but since this is our first, we will simply use `root :to => "<controller>#<action>"
Note: Rails does not require code within the action (method), only that it exists. Note: Only one root route can exist. Note that the h1 tag is has a look and feel defined by the h1 definition in Twitter's CSS. ..And with that we have a website, sort of. To recap we covered generating a controller and making a view page as well as adding the action with the home_controller called "welcome". That last thing I'll cover before the next tutorial is the flow of a request. 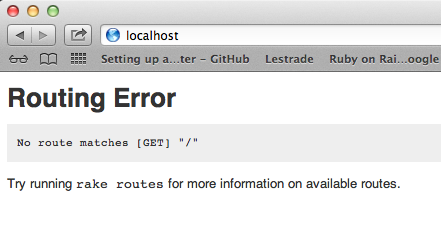 So when you request http://localhost/ this is what is happening. The config/routes.rb file is checked to see where this request should go. Since the request is for the root page '/', it is rerouted to the Home controller and Welcome action. Immediately following any code executing in the Welcome action (none right now), the request finally lands on the view page or the last part in it's journey, welcome.html.erb. 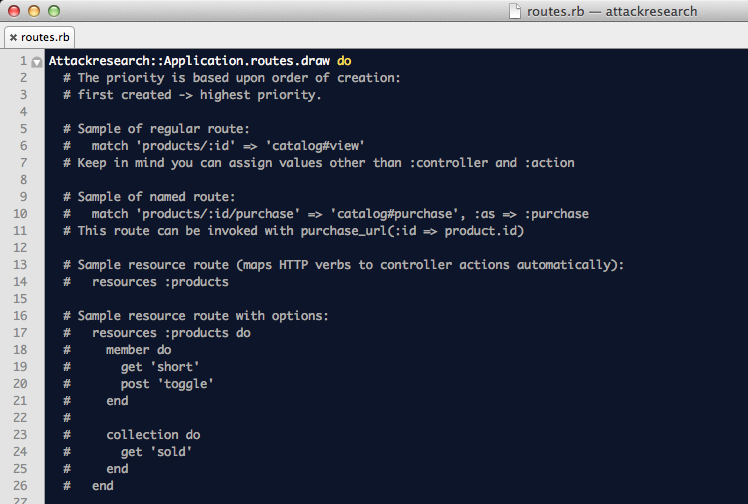 Again, the flow is route -> controller -> view. Added the directive render :text => <some text> which stops the flow from reaching the view page and renders content itself. The outcome of this change. Thanks for following along, more to come in the next post as we dig a bit deeper with routes and the MVC. This Metasploit module exploits a vulnerability found in Dorn Content Management Script (CMS), version 1.4. By abusing the add_page.php file, the attacker can upload/add a new file (.php) to the /cms/pages/ directory without any authentication, which results in arbitrary code execution. Lead Capture Page System suffers from a cross site scripting vulnerability.